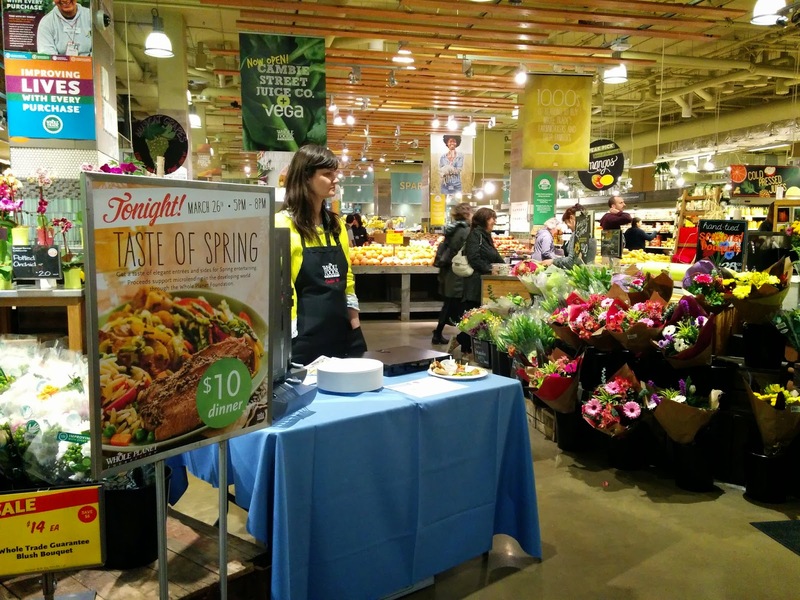 Taste of Spring is a tasting event at Whole Foods Market that happens every once in a while. You purchase a $10 passport, the proceeds of which are donated to the Whole Planet Foundation, and load up your plate from stations around the store.You can also get a take-out container and bring the foods you couldn't finish home with you. And believe me, you won't be able to finish! There are tons of stations around the store. I went to the Cambie St. location towards the end of the event so two of the vendors already had left. There were still plenty to visit though! The largest sampling was from the prepared foods section. They were serving dishes from their Easter menu: Sweet Potato Tzimmez, Asparagus with Julienned Vegetables and a beef brisket but they had run out so I got the substitute pork loin. I really liked the sweet potato and the vegetables but the pork was a bit dry for my taste. Making my way through the store, there were lots of stations in the bakery section. Lots of breads, desserts, healthy granola and granola snacks to try. Most of these were bit sized samples but some stations had multiple flavours or types so you get full pretty quickly! Uprising Breads give a half of a hot-cross bun to each person! Pretty fun little food event. Whole Foods Market usually hosts similar events throughout the year so if you missed this one, you'll have other chances!